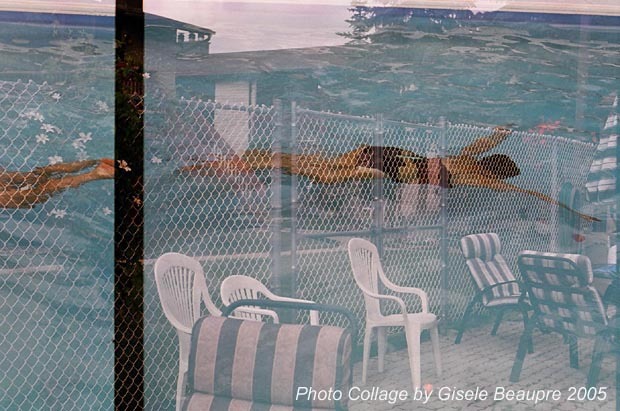 Pool 1, 2005, Double exposure photographs, Portfolio, Gisele Beaupre, M.F.A. This image is one of the more interesting results of this ongoing double exposure experiment. I believe it is a better collage than I could plan or make. I like the element of chance, and the connection to that intelligence which is beyond or greater than the field of the mind. We in north america tend to think of the mind as being our brains, but it is not just that. There are many different states of mind and thus experiences, from sleep to self-realized.